Hi Folks! Christi from Scrapping For Tranquility here, I am honored to be the Guest Designer for fotobella.com this month! yes, pine cones and acorns falling from the trees! So that is what I decided to make for you today! 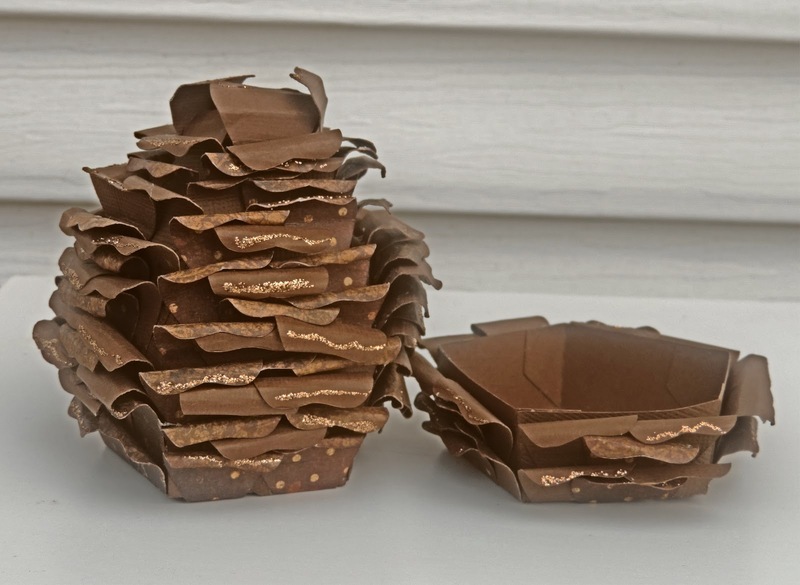 I cut the pieces from my Silhouette Cameo 3 out of Brown Solid Core Cardstock to take the shape of the acorn. Then using Bo Bunny Dreams of Autumn-Sweater Weather, I made the panels to go over the acorn "shell". If you have not noticed, this is a gift box! For the lid, I used the opposite side of Bo Bunny Dreams of Autumn-Foxes. The orange was a perfect coordinating match with the orange dots on the panels. That is what I love about this Bo Bunny Collection. It all coordinates so well together. 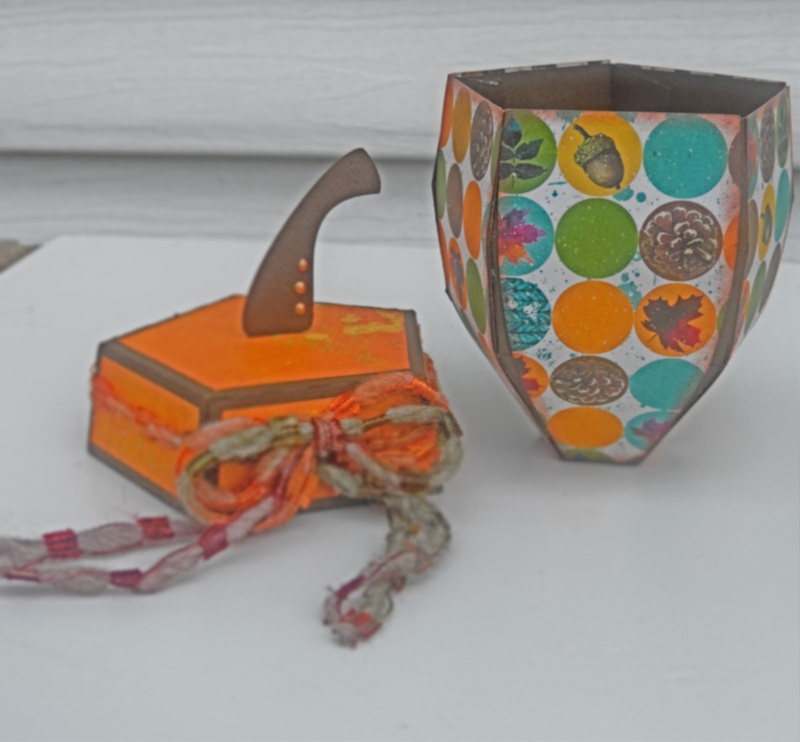 Taking some fibers I had in my stash, I wrapped it around the base of the lid and then created a triple bow with it. I really liked the way that looked since all the same colors where in the fibers. To top it all off, I added 3 small dots of Ranger Stickles-Copper to the stem of the acorn to give it a little bling. I am truly pleased how it came out! 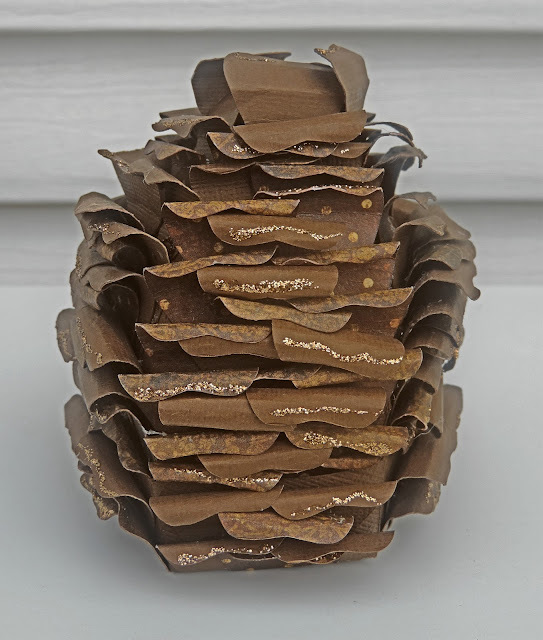 The pine cone was not as easy but so much you can do with this! Again, I used brown solid core cardstock for the base of the pine cone. 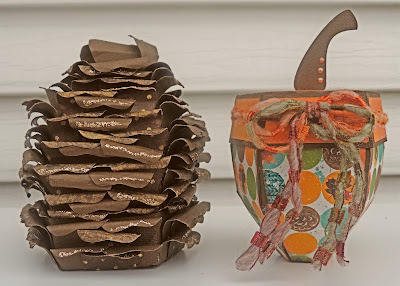 Then using Bo Bunny Dreams of Autumn Double Dot Collection-Chocolate Vintage and the brown solid core cardstock, I rotated between the two, rolling the tips of the cardstock to create the pine cone effect. 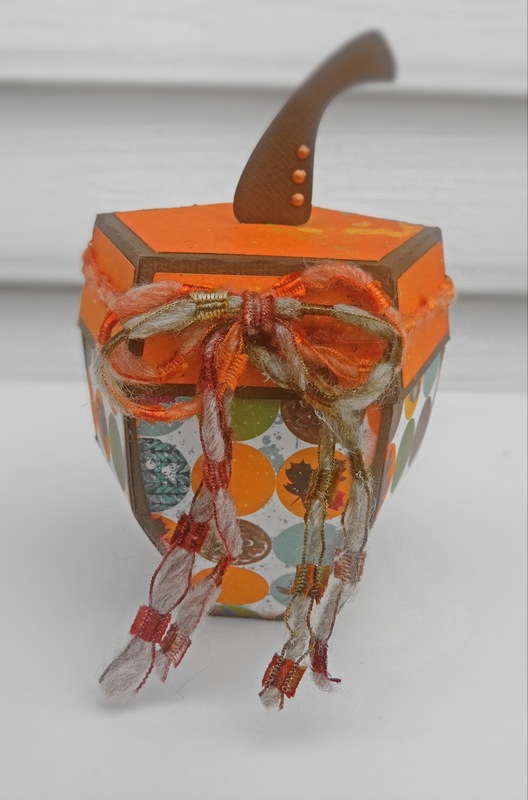 this is also a small gift box or a small hiding place for your goodies! To finish my project off, I again rotated every other piece and added some bling with some Ranger Stickles-Champagne color. It gave it just the right amount of sparkle! If it was winter you could add white to the tips for snow and it would look really nice also for pine cones with snow on them for another effect. I hope you enjoyed my post and I hope you have a very happy first day of Autumn! Leave me a comment and let me know what you think!